My daughter recently showed an interest in stars! She began pointing out star shapes from books, pictures, and especially the story of Baby Jesus from one of her Bible lesson books. 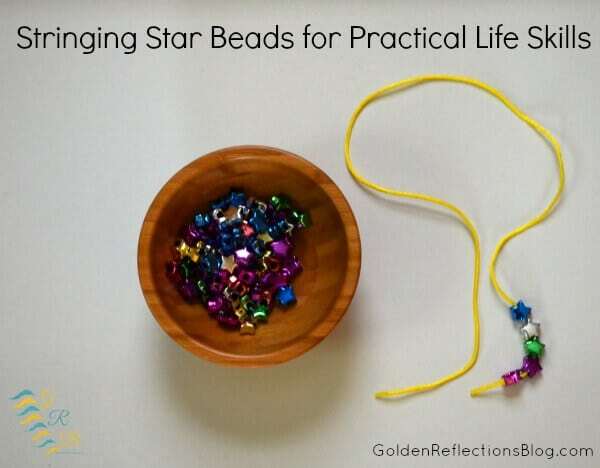 So I developed this little stars and the color yellow week for her, perfect for montessori homeschool for toddlers. You will find a list of all the items and activities I had available for her during that week. 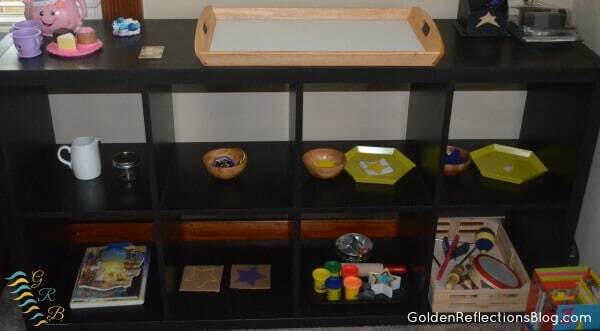 All of the items were set up in our Montessori homeschool area in the living room on her shelves. She also has a little table and chairs that she is able to use to place activities on. 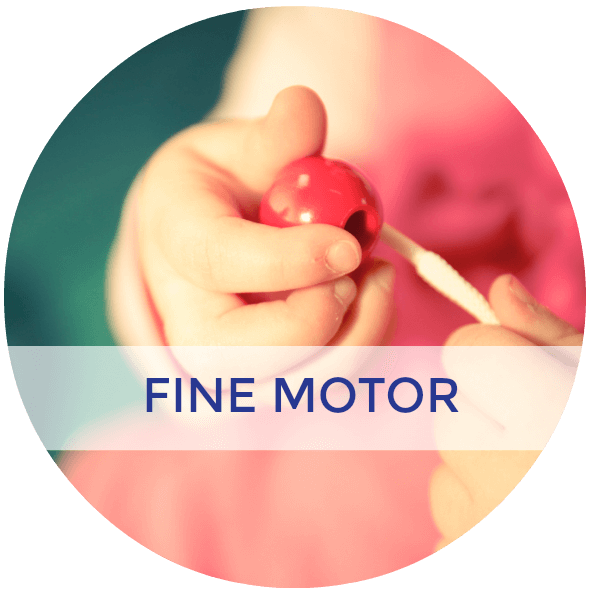 Most of the activities were designed for sensorial and practical life activities, since developmentally, that is where she is at. Things like pouring, stringing, opening and closing containers are all considered practical life activities. 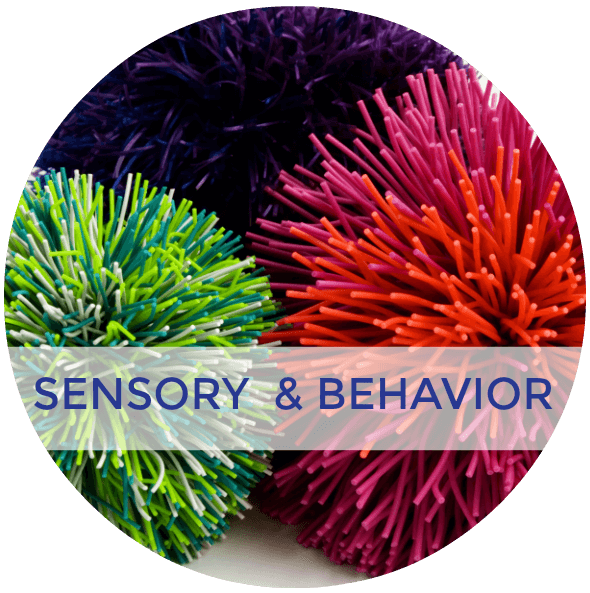 And then all of the hands-on and different textures we used are the sensorial aspect. 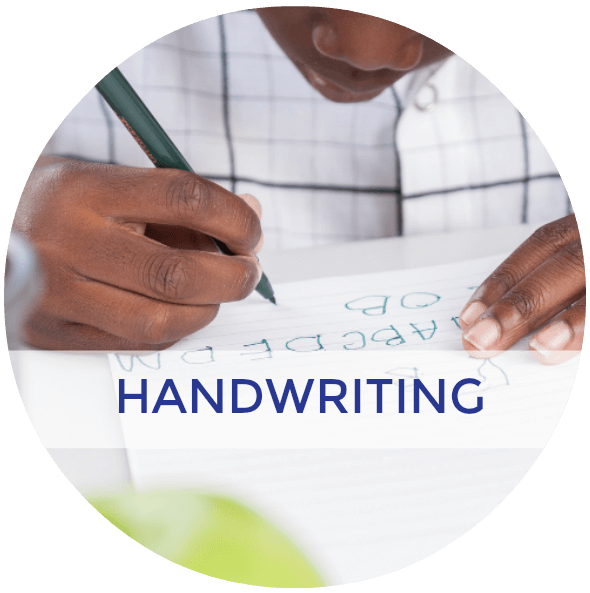 For more information on how to use Montessori homeschool for toddlers, I highly recommend the book Montessori At Home by John Bowman! Also note, because I am a Christian I did include a Christian spin on some of these activities or extras. However, you can easily omit them if you do not wish to include the Christian aspect of this theme. 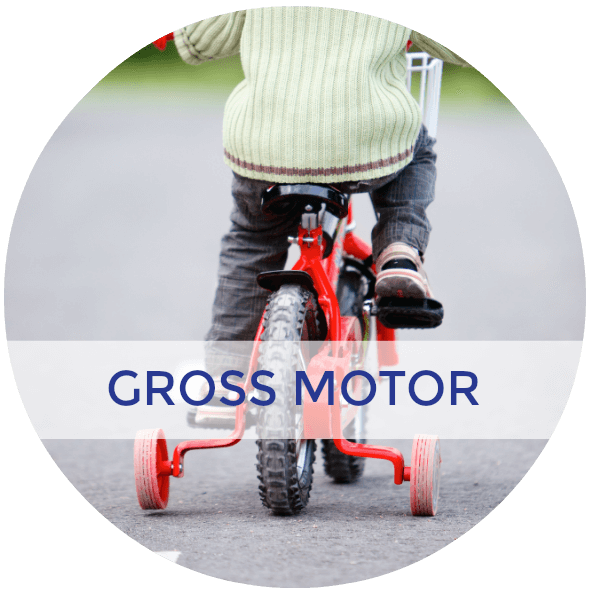 I have included it because that is part of our lifestyle and how we are training our daughter! These are some of the books we have on hand that either specifically talk about stars or have stars mentioned in them. Please note that I did include Christian titles in this list. 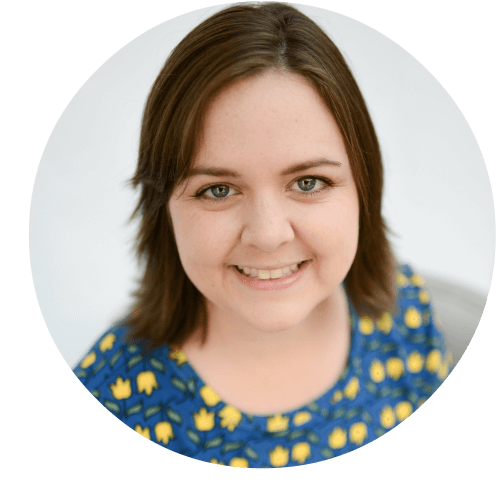 However you can easily omit those if you do not wish to the include the Christian aspect. One other jar to pour into, I used a glass mason jar, but you could use two of the porcelain pouring jars too. 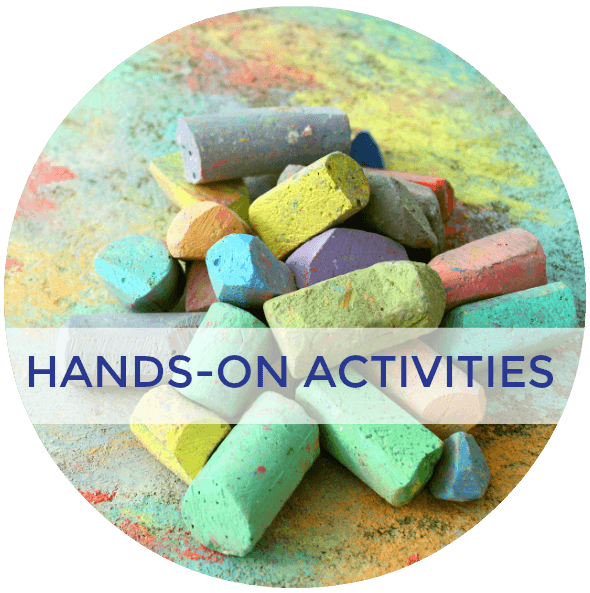 Set up the activity on your book self or task tray. 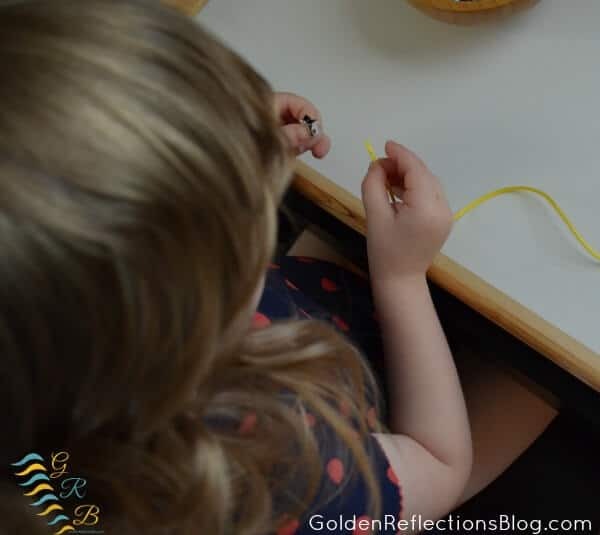 I showed my daughter how to pour the beads back and forth a few times and also what to do if a bead fell out onto the tray or off the tray. After those initial cues, I sat back and just let her explore the activity any way she wanted to. 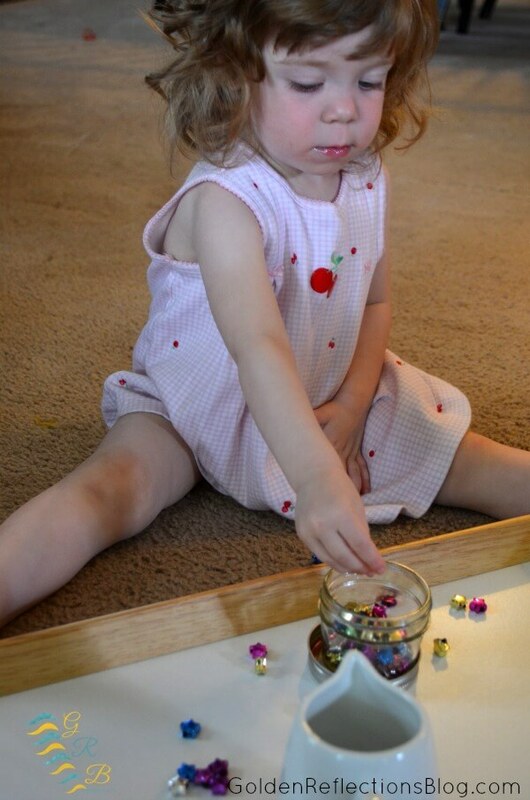 She ended up taking the beads out one by one and transferring them over to the glass jar with her fingers. This one has been a favorite so far! 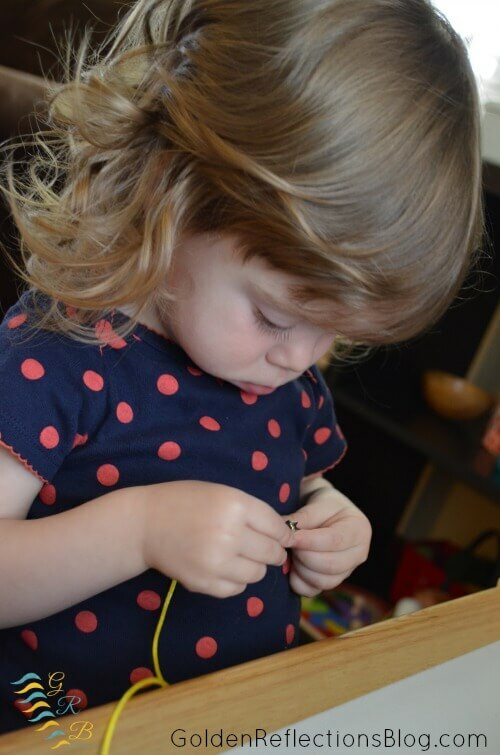 E sat at her little table and attempted to string these beads for close to half an hour! 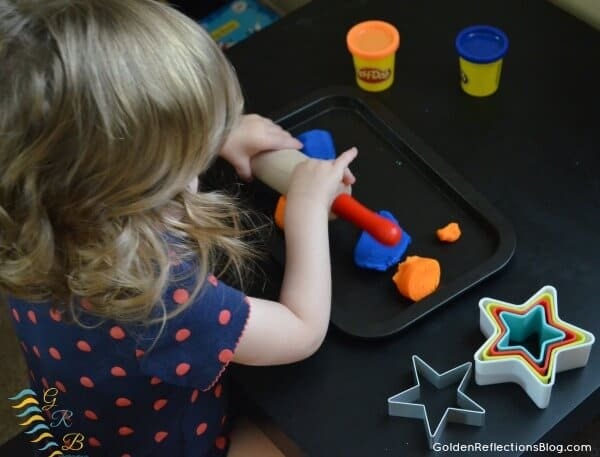 She was so intent on it, her concentration was very good, which means this activity was perfect for her! I did offer her some pipe cleaner to try, but she preferred trying with the string. 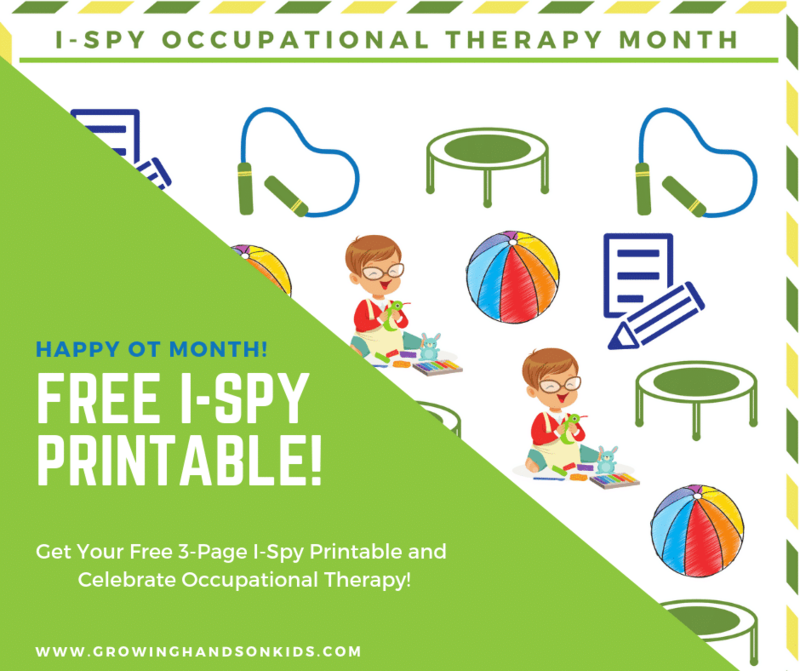 Print out the yellow star cards and the 3″ star cutout template from the free printable I offer below. 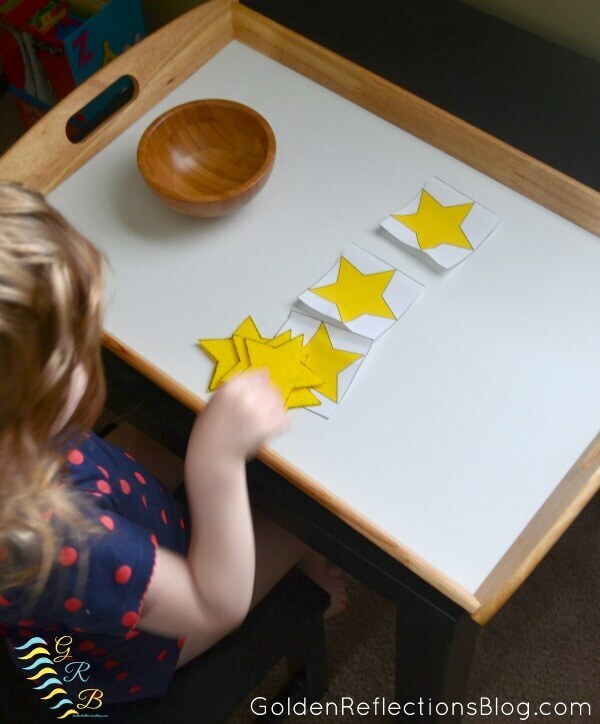 Laminate the yellow star cards and cut each card out and place them on the task tray. Cut out the star cutout template and use it to trace the stars onto the felt and then cut them out. 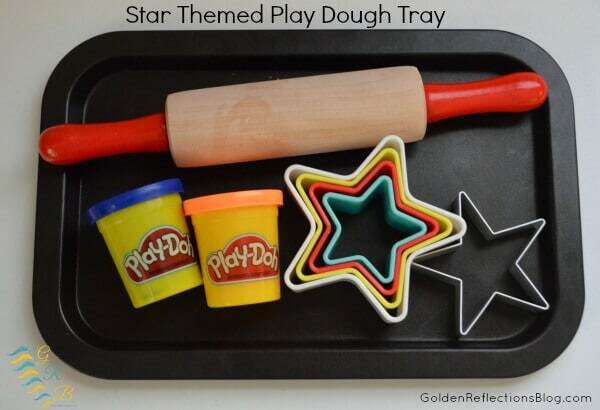 Place the star felts into a task bowl on the tray. Make sure you have the same amount of felt stars to the yellow cards. E is still learning her colors, but she did match a couple of the star felts to the cards. The directions for this tray are the same as the yellow one above. 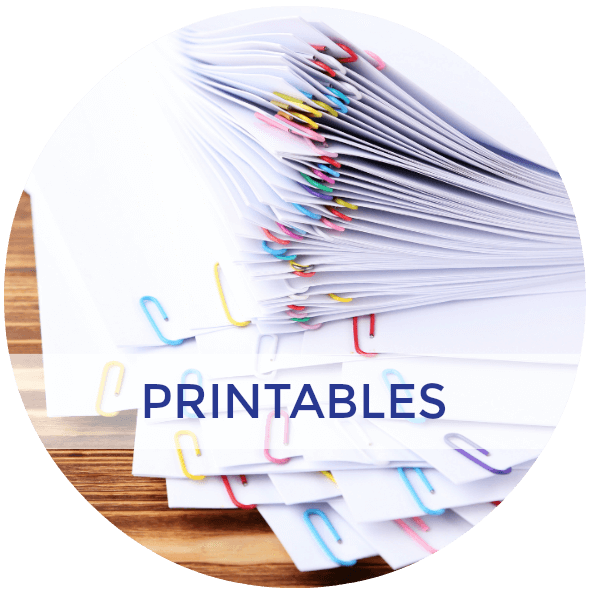 In the printable I also include labels that you can use to label each color or shape as well. You can use these are older toddlers or those ages 3-6. *Note, I only had purple colored sandpaper at home, so that is what I used. Once I am able to get regular colored sandpaper I am going to make another one using this same method. 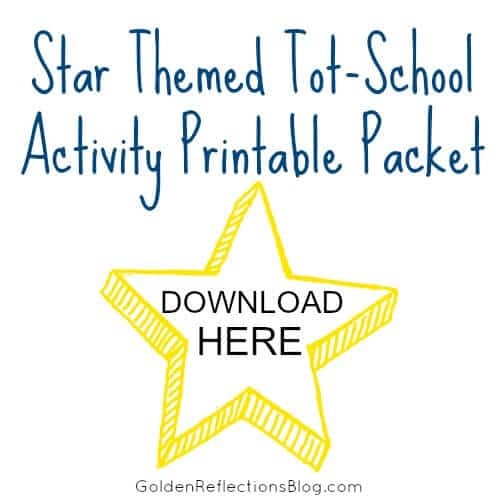 I used the star template that I have in the printable packet below. I cut it out and then used it to trace the star on the back of the piece of sandpaper. Then I used scissors to cut out the star shape from the sandpaper. 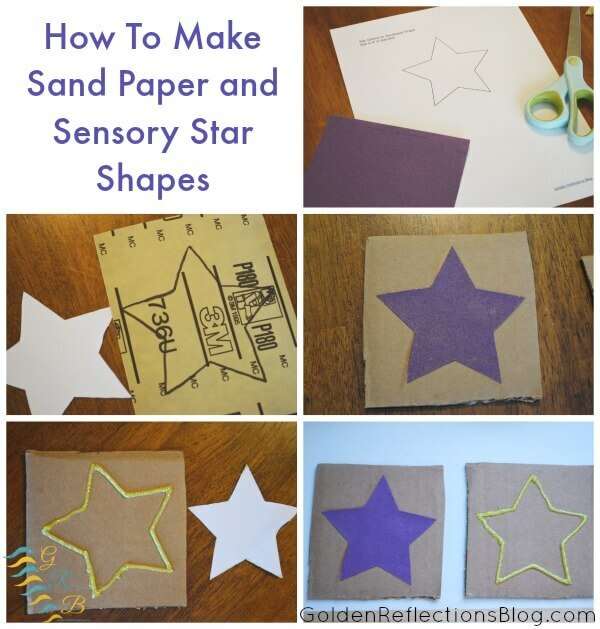 Next, glue the sandpaper star shape to the back of a piece of cardboard or foam board. 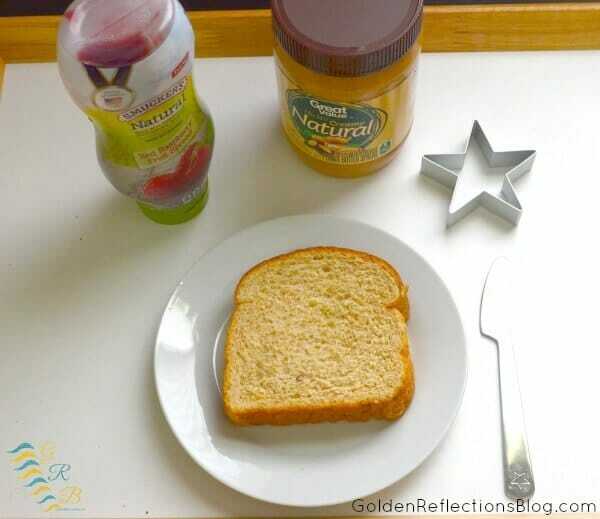 To make the glitter glue shape, I placed the same star template on top of a piece of cardboard. I took the yellow glitter glue and carefully followed just outside the star shape on the cardboard. Then I carefully lifted the star template from the middle of the shape and fixed any of the glue that went over. I let both shapes dry overnight before letting E play with them. I placed all the items out on our tray and had E help with as much of it as she could! 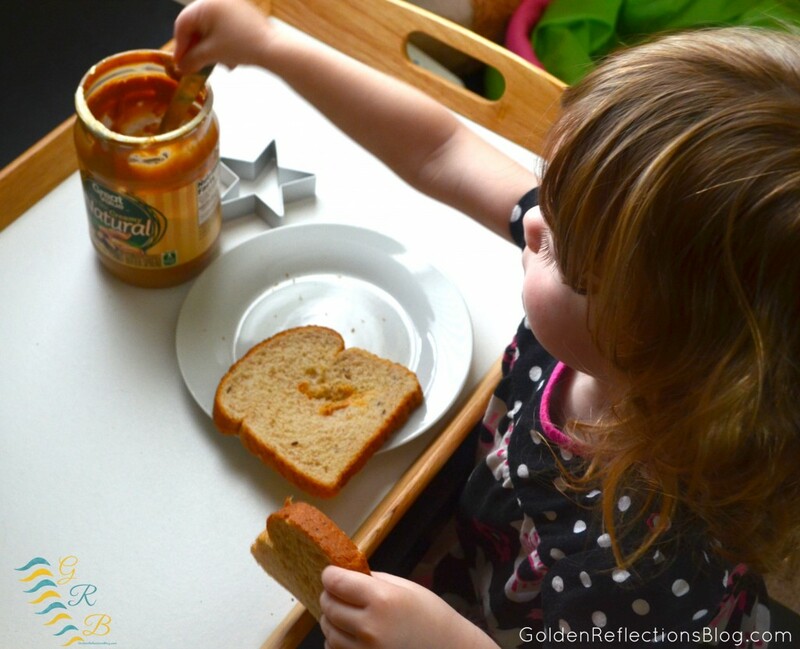 She liked taking the peanut butter out of the jar and trying to spread it with her butter knife. On one of the shelves for our Montessori activities, I included the stack of books listed above. I also included a felt set that we have that is the story of baby Jesus. We also read the story of baby Jesus and talked about the star that the shepherds saw and followed. Here is a picture of what our Montessori inspired shelves looked like for the week. The tray on top is the task tray that I put all the activities on, and it goes on her little table when she works with them. 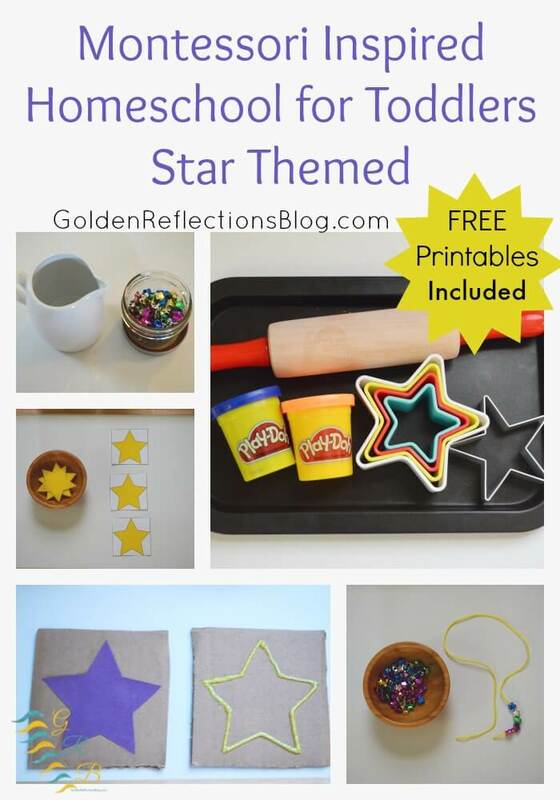 FREE Printable Packet of Montessori Homeschool for Toddlers: Star Themed Tot-School Week! 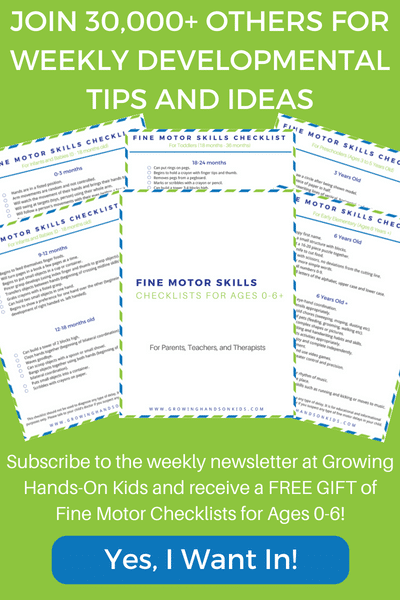 To get your free printable packet of the Montessori Homeschool for Toddlers: Star Themed Tot-School Week either click the graphic below of the link below! 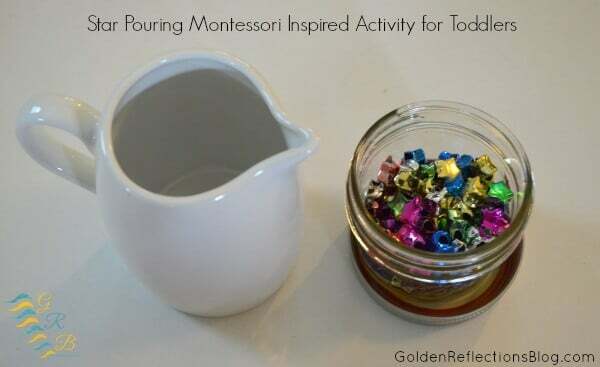 Follow Heather @ Golden Reflections Blog ‘s board All things Montessori on Pinterest. Linked up at Tot School Gathering Place.